Last year I published a really great slime called Unicorn Poop that everyone so far as adored. With its soft colors, its a perfect slime that is so much fun. I wanted to update that recipe with a change in colors, making another striped slime with a slight unicorn variation, and show y’all how easy it is to change up the slime with any color scheme. 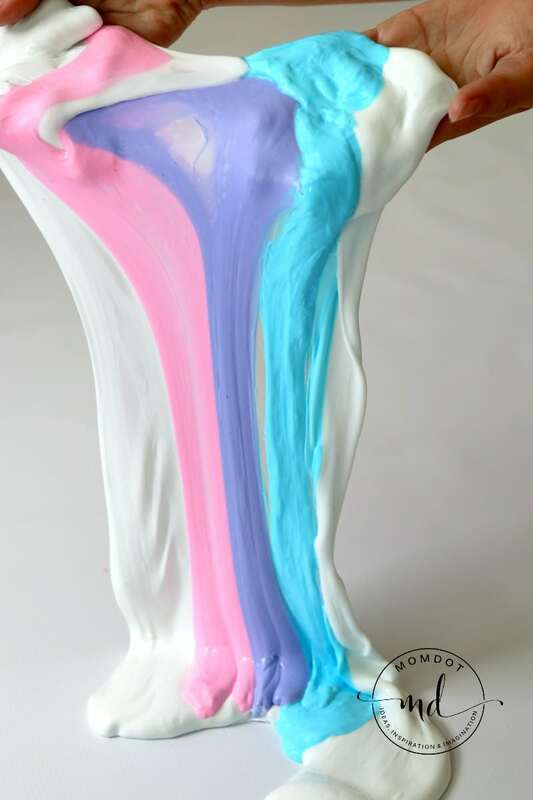 Also a “unicorn poop” slime, it has a white base with gorgeous pink, blue and purple. If you scroll down, I’ll also show you what happens as you play with multi-colored slime in the end! FREE PDF FILE for UNICORN POOP SLIME at bottom of article! Print and save! PRO TIP: Many people do not like to deal with borax and water when making slime- I know I don’t. 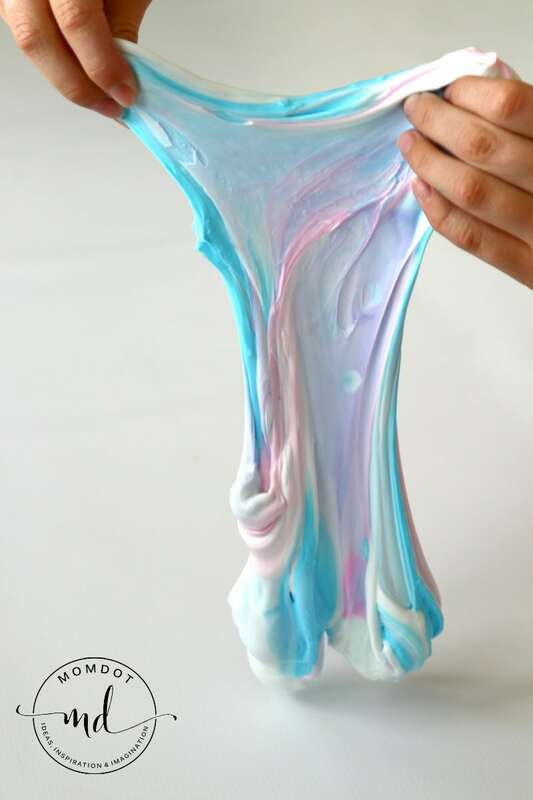 You can make slime by using LIQUID STARCH and glue. It’s a ton easier. That being said, it can be pretty hard to find liquid starch, so pick this one up here (it’s the one I use) as well as a huge gallon of glue so you can make tons of slime for all occasions. Buying this way is a lot more cost effective and once you start making slime, you will def want to have glue on hand! When it comes to the gallon size glue, if this one is out, go to the “Available by these sellers”. Due to the popularity of many of MomDots recipes, stock seems to come and go on this item. If you see one, grab it! Its IMPOSSIBLE to find gallon glue in the stores! I use liquid starch in nearly all of my slimes. While NO SLIME should go in your mouth, I believe that starch is safer than borax for play (says GREAT FOR CRAFTS on the bottle) and has results you can trust. Borax is so hard that often slime is hard as a rock. Starch is easier to predict results with. If you are looking for additional non-borax slime ideas, you can head over and see more. Always supervise your kids when playing with or making slime. GLUE! It is SO hard to find this much. I have never seen a gallon in the stores at all. 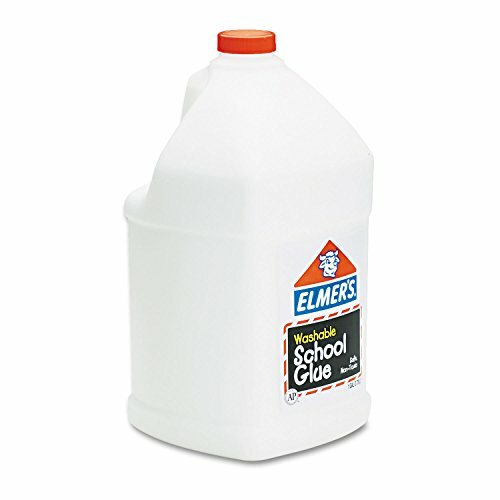 You can buy gallon of glue from Amazon so you don’t have to be stingy when making slime. Plus if you make a mistake, you have extra to counter balance or create more. There is nothing worse than wanting to start over and you don’t have the glue on hand. A 4oz bottle of glue won’t net you much more than about 2/3rds a cup (I believe). 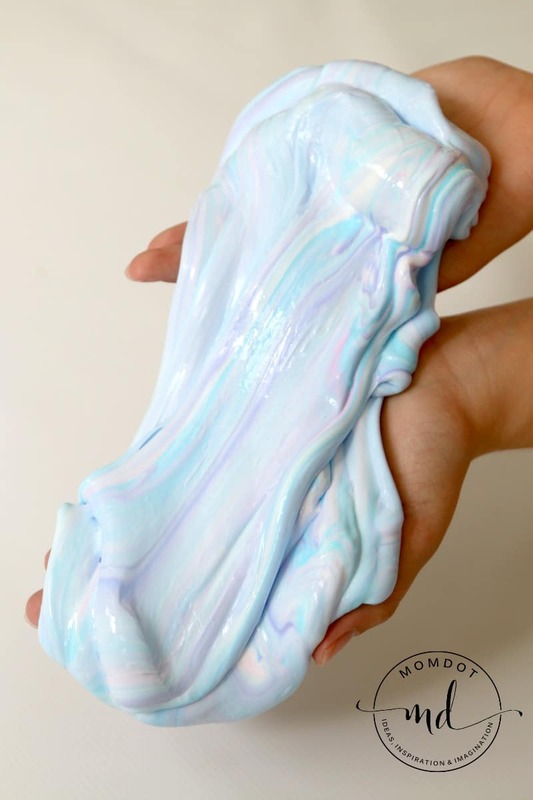 For this type of unicorn slime, you will need lots of glue for the multiple colors. COLORS! To get bright beautiful colors you can use Wilton’s Color Right Performance Color . If you want soft colors, you just use a half a drop or even a toothpick dipped in and then dipped in your glue. 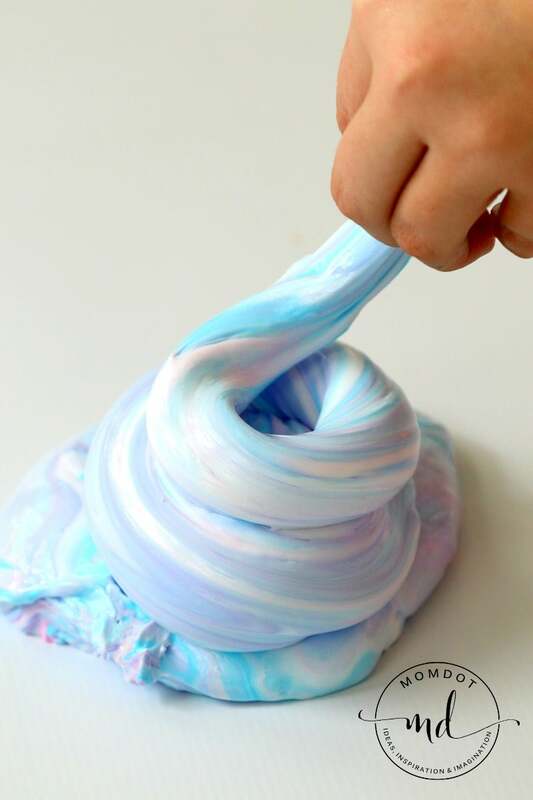 Here are some tips on creating a good slime to play with. The ratio to a good slime is about 1/2 cup white glue and 1/3 cup starch. You simply mix the two together and start kneading it back and forth until its no longer sticky. NOTE: The more starch you add, the thicker and more low flow your slime will get. If you add too much starch, it can become hard as a rock. While 1/3 cup starch works for us, I recommend putting a bit less (try 1/4th) and check out that consistency and see if its what you want before adding a little more. Its so much easier to ADD a little than take some away. Here is where people fail: They give up! Slime takes a little time to mix together and unlike a food recipe, the mixing can take up to about 7 minutes to get right. One thing that works for us is to do about 1/4th starch and mix and then let the slime sit in the bowl for a few minutes. 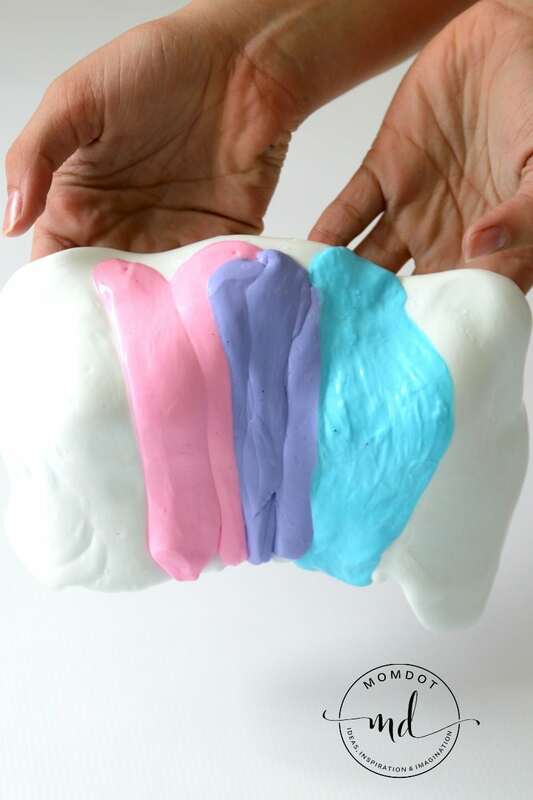 It allows the glue and starch to work together. The real issue with slime fails is that most people do not knead it long enough. Treat it bread dough- it takes a little bit of time. So many people message me and ask me how I get slime so perfect…..well, it goes through stages and some people quit before they get to the slimy stage! I did a video showing you what you can expect when you create your slime. It’s a lot easier than you think. Yes, there are two ads in this video near the beginning, which help pay for all this slime recipes and ideas that are provided here and we appreciate your support in keeping those costs down. I think you will like this video and it will help get you less frustrated in creating slime and figuring out the direction you are going. Please note this video is specifically about using WHITE glue. Clear glues and glitter glues are a different consistency. Once you have the perfect slime, try blowing bubbles with it! 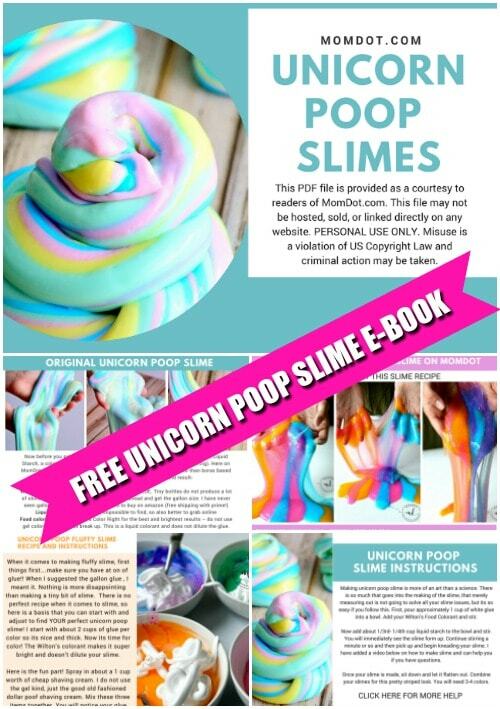 Download FREE Unicorn Poop Slime E-Book! 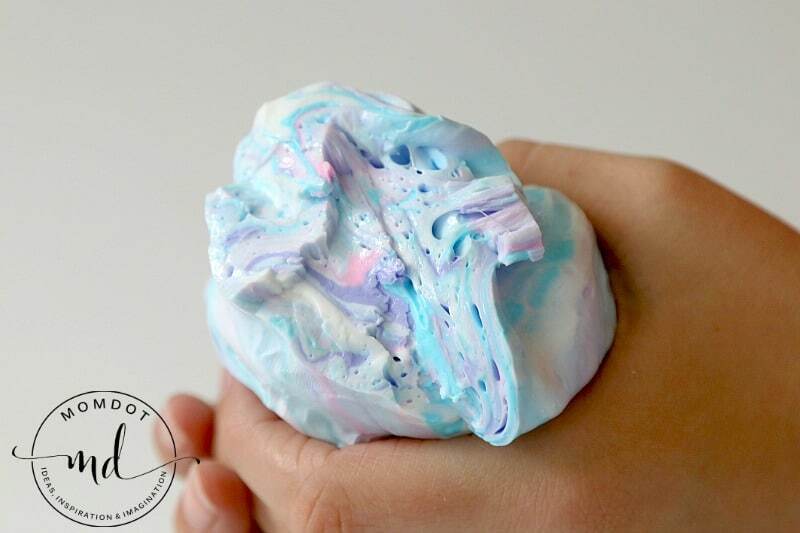 There are so many great unicorn poop slime recipes here on momdot, that I put this original one and a few others in a simple full color download file! Just print off here so you can enjoy from home. This file is for personal usage and contains a recipe for unicorn fluffy slime as well as this original unicorn poop slime and other links back to the other unicorn slimes. Your kids or classroom will love it! Do not worry, the PDF file has links that will send you right back to the original posts for more instructions and images. Just click HERE or below to begin an instant download.